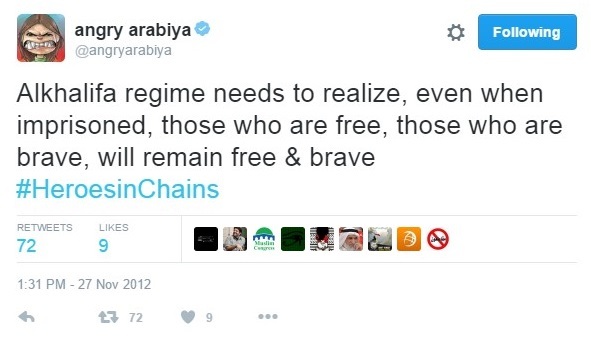 15 November 2016 – Using her Twitter handle, @angryarabiya, Zainab al-Khawaja amassed nearly 50,000 followers and became a prominent voice of the 2011 pro-democracy movement in Bahrain. She, along with fellow human rights defenders, provided on-the-ground updates on protests and demonstrations via her Twitter page. Her cyberactivism helped bring greater international attention to the human rights abuses committed by the Government of Bahrain. Some of al-Khawaja’s Twitter posts highlighted the arbitrary detention of her father, Abdulhadi al-Khawaja. He is one of the founders of the Bahrain Centre for Human Rights (BCHR) and a prominent human rights defender. In 2011, following the harsh repression of the pro-democracy movement, the Bahraini government sentenced him to life in prison for his participation in protests. Additionally, Zainab al-Khawaja posted tweets that advocated for democratic reforms, highlighted specific cases of human rights violations, demanded the release of political dissidents and activists, and reported the poor conditions she and other detainees suffered in Bahraini prisons. Al-Khawaja’s online activism and her participation in protests led to eleven total arrests, where charges violated her internationally-sanctioned rights to free expression and assembly. In 2012, Bahraini authorities arrested her for alleged unlawful entry to a protest at Pearl Roundabout. In 2013, forces charged her again for taking part in a sit-in in front of the Royal Palace in Al Qudaybiyah. On 4 December 2014, al-Khawaja received a three-year sentence for tearing up a photograph of King Hamad. A court handed down an additional one-year sentence after she tore up a second picture of the monarch during her trial for the first charge. Government forces carried out this sentence when the arrested al-Khawaja and her infant soon on 14 March 2016. The arrest of al-Khawaja and her young son soon caught the attention of a number of internationalorganizations and news outlets. Despite such international pressure, Bahraini officials did not immediately end her imprisonment. On 7 April 2016, during a news conference with US Secretary of State John Kerry, Bahraini Foreign Minister Khalid bin Ahmad Al Khalifa vowed that al-Khawaja would be freed on a “humanitarian” basis. On 9 May 2016, more than a month after Al Khalifa’s initial promise, the Foreign Ministry reiterated its pledge but still delayed taking any action. It was not until 31 May 2016, amidst growing international criticism, that Bahraini authorities followed through on their promise to release al-Khawaja. However, al-Khawaja’s release was not unconditional. Authorities did not dismiss her convictions, and she remained under threat of re-arrest at any time. After Bahraini authorities told the Danish Embassy that they would arrest her if she remained in the country, al-Khawaja, who is a dual-Bahraini-Danish citizen, fled to Denmark in early June. As she announced her exile from Bahrain, al-Khawaja vowed she would “carry the cause on her back” as she left her country. As a signatory to the International Covenant on Civil and Political Rights (ICCPR) and the Universal Declaration of Human Rights (UDHR), the Government of Bahrain is obligated to uphold citizens’ rights to the freedom of expression and assembly. Thus, the arrest of Zainab al-Khawaja and other human rights activists is a violation of Bahrain’s international commitments. The government should unconditionally drop all charges against Zainab al-Khawaja, allowing her to return to Bahrain without threat of arrest. Additionally, the Government of Bahrain should immediately release all political prisoners of conscience who have been charged and convicted for exercising their rights to free expression and assembly. Danielle Lilly is an Advocacy Intern at ADHRB.